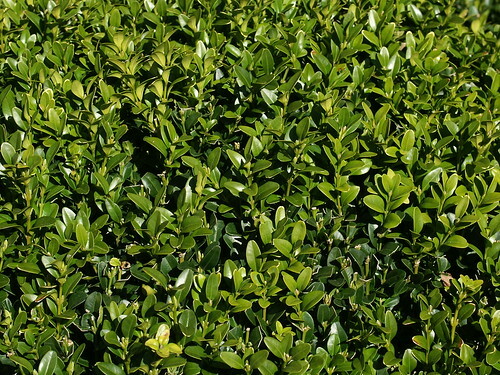 American boxwood (Buxus sempervirens) grows 15 feet tall with a spreading habit and it has leaves that are dark-green on one side and yellowish on the other. It's commonly used in topiary and other decorative landscaping designs, and can grow nearly anywhere, in most types of soil, and both in sunlight and light shade. To produce healthy buxus plants that can withstand the heavy pruning of topiary work and keep up its green color, you must provide adequate fertilizer. 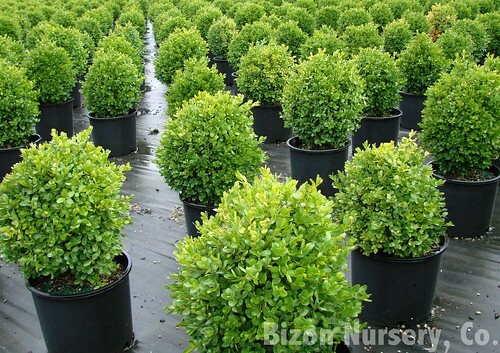 Water-soluble liquid fertilizer, applied regularly, is extremely effective food for buxus. Grow boxwood in sites that offer full shade to full sun, but provide the plants fast drainage. Even in well-drained soil, give the plant a break from continuous moisture by placing them away from downspouts. Slow growing. If left to grow into a natural shape, it most often grows in a gumdrop shape. The growth is dense, with many branches supporting leathery 1-inch long leaves, and the foliage has a distinct odor that some people don't like. Also, Buxus is evergreen through the winter and has flowers that attract bees in April and May. Water newly planted boxwood bushes to a depth of 8 inches whenever the soil surface begins to dry. Give established boxwood shrubs 1 inch of water weekly. Adjust this schedule whenever it rains. If you have a broadleaved cultivar, continue to irrigate it in winter, as the shrub loses moisture through its leaves. Insulate the boxwood's roots, conserve moisture and reduce weeds by building a 3-inch-deep mulch ring around the plant's base. Use wood chips, dead leaves or other organic matter. Replenish the ring as the material decomposes. Get a soil test done if your boxwood appears unhealthy. Contact your cooperative extension office for details. Add amendments based on the soil analysis report you receive from the lab. Install a temporary trellis next to your boxwood for a makeshift wind barrier. Cover it with blankets in windy winter conditions to prevent the foliage from drying out and turning brown. The trellis is necessary to keep the cloth from touching the foliage. Shear young boxwood plants in early summer to encourage branch development. Prune all new growth that appeared that season. Rejuvenate old shrubs by cutting them back to 3 feet from the ground at the beginning of winter. Mix liquid plant fertilizer and water according to the specific product instructions. Use a balanced, all-purpose fertilizer; buxus does not require extra types of nutrients. Spray the soil surrounding the buxus plants with the recommended amount of fertilizer every two weeks during the growing season, which is generally from early summer to early fall. Remove any dead or decaying wood in the spring and as needed throughout the year using sharp bypass hand pruners. Pull back the branches to reveal the inside of your plant. You will notice that the leaves are growing only on the outermost portion of the branches. Using sharp bypass hand pruners, cut off 6 inches of a stem, removing the outer branch. Do this to about 10 percent of the outer branches, thinning out the entire shrub and allowing sunlight and air to circulate inside the shrub. Using a hedge clipper, trim any new growth back to keep a tidy look if your boxwood is already at its mature height. Allow new growth to remain if your boxwood has not yet reached its final height. Trim any unruly growth throughout the summer to maintain its shape. Trim any areas that you do not want to grow. Trim the top slightly narrower than the base. The wider base will help the entire boxwood to receive the sunlight it needs. A lack of certain nutrients in the soil will cause a variety of discolorations in common boxwood. White or orange on the tips of the leaves may be a symptom of a potassium deficiency, which can be remedied by using a plant fertilizer such as Vitax Q4HN. Leaves that begin taking on a bronze color may be symptomatic of a potash deficiency, which is usually tied to excessively dry soil. Many different species of insects can cause adverse effects in buxus sempervirens and related species. Leafminers, psyllids and spider mites are all parasites that are known to feed on boxwoods; an application of granular or spray pesticides is the only treatment that can completely remove these pests. Root knot and lesion nematodes are among the most common parasites affecting boxwoods. Nematode infestations can be remedied by liming the soil and raising the soil’s pH to 7. Boxwoods do need to be watered, especially if they are in direct sunlight, but too much water can cause root rot. The leaves of waterlogged boxwoods turn yellowish-brown and begin falling immediately. Drought conditions cause new leaves to turn blue, while more mature leaves begin turning yellow and orange. Formal gardens, topiaries and as edging in garden beds.